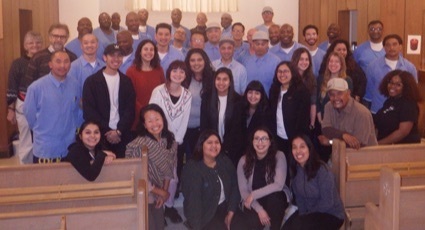 Three times over the course of Winter Quarter, students met in the prison chapel with 28 incarcerated men who are committed to Childs's ideas about "transcommunality," a theory of social transformation based on building understanding and mutual respect among people from diverse backgrounds. "When you are here, I forget that I am in prison," one man told the group. As she approached the Soledad Correctional Training Facility for the first time, Willow Lee was nervous about meeting the men who would be her classmates for 10 weeks. She was intimidated by the checkpoints, barbed wire, and clanking gates. But when she entered the prison chapel and saw 28 incarcerated men waiting eagerly to greet each of their UC Santa Cruz counterparts with a handshake, she felt a wave of positive emotions wash over her. "The men looked me in the eye. They were so excited. They radiated warmth and the power of hope," she recalled. "I felt welcomed." 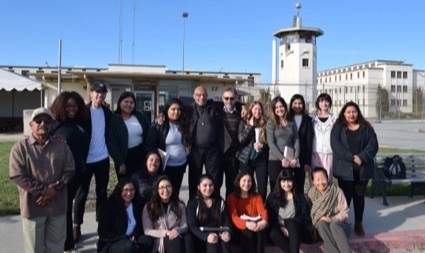 And so began a first-ever class called "Transcommunal Cooperation and Peacemaking," a joint endeavor of UC Santa Cruz, College Ten, Soledad Prison, and Barrios Unidos, a Santa Cruz-based youth-violence prevention program. For ten weeks, 14 undergraduates and 28 Soledad students studied and discussed writings about nonviolence, racism, colonialism, toxic masculinity, and poverty. They examined cases of peacemaking and social justice movements in Northern Ireland, Sudan, the United States, and elsewhere. By all accounts, it was an extraordinary quarter. Lee wrote after that first meeting that it left her feeling "the most empowered that I have ever felt in my entire career of social justice." "It takes a lot of courage to come into a prison and sit behind locked doors for four hours with people convicted of very serious crimes," said Professor Emeritus of Sociology John Brown Childs, who taught the class. "These men are tired of violence. They don't want to do it anymore. They emphasize nonviolence and peacemaking. This is about redemption and transformation and being able to be compassionate about others." Childs pioneered the theory of transcommunality and sees it as a way to bring people from diverse backgrounds together to overcome stereotypes and build mutual respect—without trying to change minds or "convert" anyone in the process. "It's about people being able to work together from different perspectives and learning through interaction," said Childs. "It's not a melting pot approach. It's a cooperative approach." Childs has taught transcommunal peacemaking in local prisons for 13 years through Barrios Unidos's Prison Project. His students at Soledad went on to form their own ongoing educational group of "peace warriors," the Cemanahuac/One World Cultural Group, to reach fellow inmates and support each other in their quest for redemption. It was Enrique Rivera, a facilitator of the group, who suggested a joint class with UCSC students. "Just the act of being together is a form of shared practical action," said Childs, who teamed up with Bruce Schumm, a professor of physics, and Flora Lu, a professor of environmental studies and provost of Colleges Nine and Ten, to bring the class to life. "This course is a way for people to turn hope into actuality." With growing concern among UCSC students about mass incarceration and the prison industrial complex, this two-unit class offered undergraduates something quite different. Interest was high—students had to apply to take the class—and almost every applicant had some personal experience with the criminal justice system. Alyssa Scarsciotti, a third-year majoring in sociology and linguistics, works closely with incarcerated men and women as the director of ART Initiative, a student-run program that brings art classes to the Santa Cruz Main Jail and the Blaine Street Facility. "It might sound scary to go into jail and sit next to inmates, but it's humanizing," she said. "It's powerful for both sides." The two groups met together three times—a lockdown prevented the planned fourth session—and assigned readings were the "launching point" for in-depth discussions. "They would grill you on the reading," Scarsciotti said of her counterparts at the Correctional Training Facility (CTF). "They really wanted to know what you were thinking. They are engaging. They are thinking deeply about this." The men in this self-selected group are committed to the path of peace, but the prison environment poses daily challenges. During a discussion about gang violence and a recent riot that had prompted the lockdown, one inmate said, "For us, living a peaceful life in prison is dangerous. If you choose to be peaceful in the midst of chaos, someone will notice." That stayed with Lee. "I took it for granted that I practice nonviolence in my daily life," she said. "For them, it's a risk." Scarsciotti recalled one class during which a CTF student described his childhood experience of being steeped in violence. "His parents taught him to fight back," she said. Pointing to a copy of Childs's book, Transcommunality: From the Politics of Conversion to the Ethics of Respect, he said, "This. No one taught me this." The classes were always memorable, and sometimes extraordinary, like the night a man apologized to a fellow inmate for murdering his best friend—the crime that led to his incarceration. "It was really hard for him to apologize, and he did it in front of everyone," said Scarsciotti. "It was a cathartic moment. His apology was accepted. He was forgiven. It was a really emotional class." The class impressed upon Scarsciotti the scope of need inside prisons. Many of the CTF students have been convicted of violent crimes, and most are unlikely to ever experience life outside of prison. That doesn't mean they stop craving opportunities to express themselves, connect with others, and to grow as individuals. "Education is a phenomenal outlet. So is art," she said. "It should be available to everyone. I try to view them as humans who need a resource, just like every one of us." For Childs, the class exceeded his expectations. "Sure, I wondered how we were going to talk to each other—college students and incarcerated men. But it was the best class I've ever had," he said. "It was purposeful. It was a rich learning experience." Childs was struck by the discovery of surprising common ground between college seniors, who are nervous about "re-entry" after graduation, and CTF students, who wonder whether, and how, they might one day re-enter society. They experience stress, regret, and guilt as they struggle to live each day with what they've done. Physics Professor Bruce Schumm, who co-taught the course with Childs, has volunteered at Soledad for several years, so he was familiar with the deep appreciation inmates feel for anyone who takes the time to visit them. "Their lives are very constrained," he said. "To have people come in and see their value, sense their worth, and treat them as valuable members of society is a gift." Still, this class brought out something Schumm hadn't seen before. "The men were so excited. One shared that he was unable to sleep the night before," he recalled. "Soledad is probably the least cynical place I've ever been, other than a hospital nursery," said Schumm. "Through the work the men in this class are doing, they come to see the potential and the promise in the evolution of the human spirit." In personal reflections about the class that they shared with Childs, the CTF students expressed deep appreciation. "I loved it," one wrote. "Being in the chapel, having great discussions about a homework assignment, made me feel more normal than I have for 12 years." A man who has been incarcerated for two decades—"over 80 percent of my life"—marveled at the ease with which the UCSC students interacted with their CTF classmates, saying he had expected them to be nervous, uncomfortable, and judgmental, based in part on media stereotypes of prisons and inmates. "There was no judgment. They were comfortable and saw us as students, as humans," he wrote. "(The opportunity) has restored my hope. Thank you. I wish we had more time." Another recalled that he had expected to feel embarrassed when the UCSC students walked in. "But when I shook hands with each college student, I remembered. I am human. I settled in and enjoyed the minds." Flora Lu, provost of Colleges Nine and Ten, attended the three class sessions at Soledad. A strong advocate of co-curricular engagement with off-campus groups and organizations, she was moved by the transformations she saw the undergraduates experience. This class gave them an opportunity to see incarcerated men "as whole people—thoughtful, kind, and deeply redeemable," she said. Lu also saw the CTF students buoyed, recalling one who told the UCSC group, "When you are here, I forget that I am in prison." "Being there, time would stand still and fly by simultaneously," Lu recalled. "We all hold different knowledge from our lived experiences. People just seemed incredibly present. I was often moved to tears." Lu, whose unit provided logistical and administrative support for the class, hopes it will be offered annually. Childs, too, is hopeful that this class will become the foundation of greater UCSC engagement with Soledad. He thanked university and prison administrators, including Lt. Roland Ramon at CTF and Roberta Schweers, the CTF civilian sponsor of the class, as well as his faculty colleagues and the Cemanahuac group at CTF, for making the class possible. He acknowledged all the students, whose hard work made the class so successful, and singled out alum Daniel "Nane" Alejandrez, founder of Barrios Unidos and the Prison Project, for being the visionary force behind the class. "So many people played different roles," he said. "I'm interested in socially valuable education, and that's what this class represents. It's about creating social justice and equality."